Obstructive Sleep Apnoea (OSA) is by far, the most common type of sleep apnoea, and it is caused by obstruction of the upper airway. It is characterized by repetitive pauses in breathing during sleep, often associated with a reduction in blood oxygen saturation. This may occur several times an hour with each pause in breathing lasting typically 20 to 40 seconds. With this drop in blood oxygen saturation, one is forced to awake in order to restart breathing. When one is unconsciously and repeatedly awaked, it results in poor sleep quality and daytime fatigue and sleepiness. Without treatment, OSA increases the risks of developing heart attacks, hypertension, stokes and depression. If you suspect that you may be suffering from sleep apnoea, there are simple self administered tests you may take to assess your susceptibility. This survey, created by Dr F. Chung, an anaesthetist from University of Toronto, helps to determine if you are at high or low risk for sleep apnoea. 1. Snoring: Do you snore loudly (louder than talking or loud enough to be heard through closed doors)? 2. Tired: Do you often feel tired, fatigued or sleepy during the day? 3. Observed: Has anyone observed that you stop breathing during sleep? 5. BMI: Does your BMI exceed 35 kg/m2? 0 = would never doze off. 1-6: Congratulations, you are getting enough sleep. 7-8: You score is average. 9 and up: Very sleepy and should seek medical advice. With the advances in technology, sleep testing may now be done in the comfort of your own home (unlike previously having to stay overnight in a sleep lab). A Portable Diagnostic sleep-screening device that offers enhanced flexibility and ease of use to be performed at the comfort of your home. Designed for durability, the Embletta Gold withstand demands of both the clinical and home testing environment, while maintaining its impeccable record for the high quality and high performance that sleep professionals worldwide have come to rely on. Comfort. To perform sleep screening test at the comfort in your own bed. There is no need to be worried about sleeping in an unfamiliar setting. Convenience. Since the test is done in the home, there is no need pay for additional ward charges, join the long waiting queue for sleep test in hospitals, find caregivers for family or pets. What's more, you do not have to take leave from work. Accuracy. Home–based sleep studies may reduce the invalid data (altered sleep patterns caused by unfamiliar environments), which can cause inaccurate data. Our sleep technologist is a registered Polysomnographic Technologist™ (RPSGT) and Respiratory Therapist (RST) certified under the American Board of Sleep Medicine. Embletta GOLD is AASM and CMS compliant and accepted by clinicians worldwide. 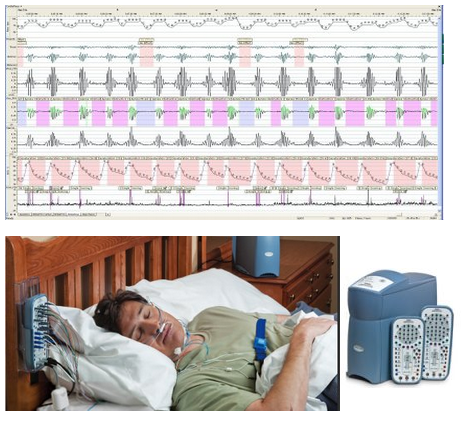 A Full PSG (Polysomngraphy) is the most complete form of Sleep Testing. This usually requires at least 1 night stay in the hospital. 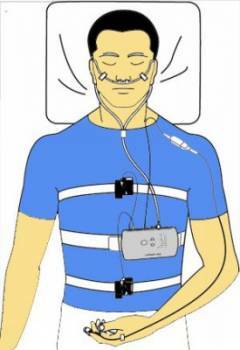 A sleep technologist will place electrode sensors to monitor your brain activity, oxygen level, eye and limb movements, muscle tone, and heart rate. Nasal cannula and belts will be placed to measure your respiratory effort. If the recordings detect effort in breathing but no airflow, you are suffering from OSA. However, if there is no effort in breathing and no airflow, you could be having Central Sleep Apnea. The signals are transmitted to a computer and finally the results are either scored by the sleep technologist or a sleep physician. A full PSG study can detect other forms of sleep disorders such as insomnia, periodic leg movement syndrome. The electrodes can record up to 60 channels of recording such as EEG, EOG, EKG,EMG. Avattvon provides In-Home Full PSG Study Service. We bring the sleep testing to your home.